Fall and Winter may not be prime wedding seasons, but really, why not? 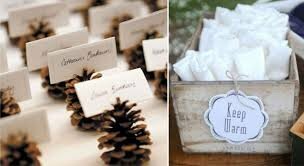 Sure the weather's unpredictable, but there are many benefits to planning an off-season weddng. Booking vendors and locations won't feel lke Bride Wars, your guests won't be suffering from weddng guest fatique, and each sentimental season offers cozy, romantic settings. The key is planning for the unexpected and working with the chilly temps instead of fighting against them. 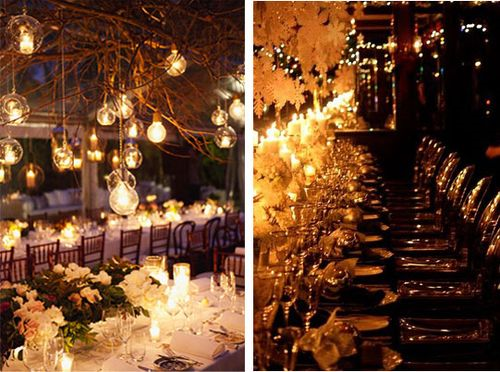 Read through some of my tips for throwing a beautiful autumnal or white winter wedding. Having umbrellas on hand when there's a chance of showers doesn't have to be just about worst-case-scenario planning. Pick out fun, pretty ones and talk to your wedding photographer about creatively incorporating them in the photo's. If your favorite flowers aren't in season, don't fret, improvise! 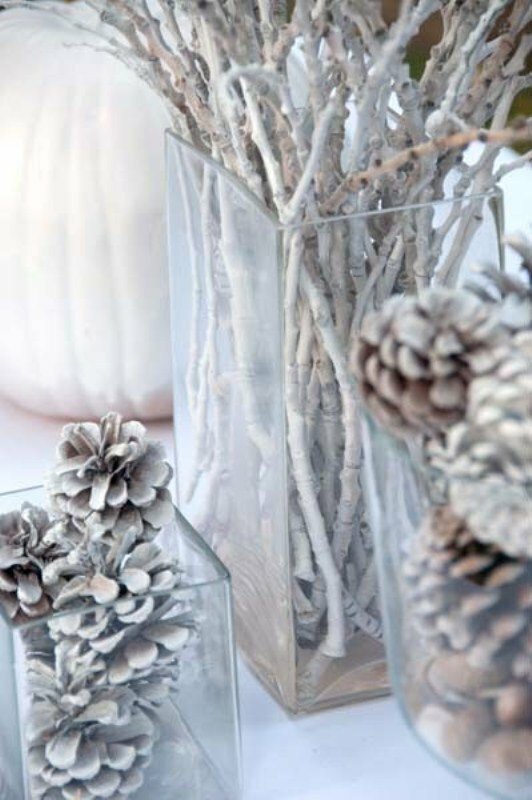 Take a cue from centerpieces that include Fall and Winter flair with pinecones and white branches with paper flowers. 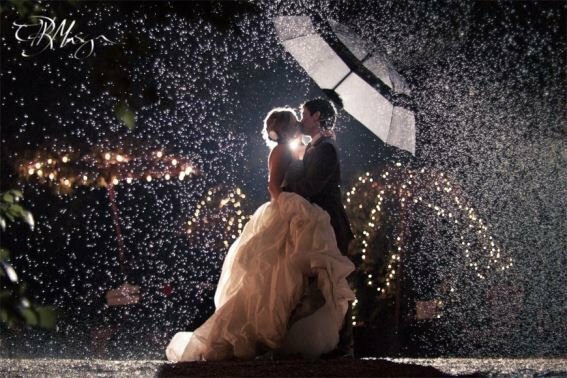 Instead of thinking of the rain as a hindrance, make the setting center stage in photo's. Winter wedding garb doesn't have to look matronly with long sleeves and a turtleneck. By adding a furcoat or shawl, you can take beautiful outdoor shots without losing your desired cut and syle. Don't forget bridesmaids get chilly too! For bridesmaid outfits incorporate Fall colour with a preppy, back-to-school vibe. Make them up out of separates, perfect for going from indoor ceremony to outdoor reception, or vice versa. When I attended a chilly outdoor function the couple had a well-tought-out plan for keeping their guests warm: blankets for favours, patio heaters and a short and sweet ceremony made for happy attendees. 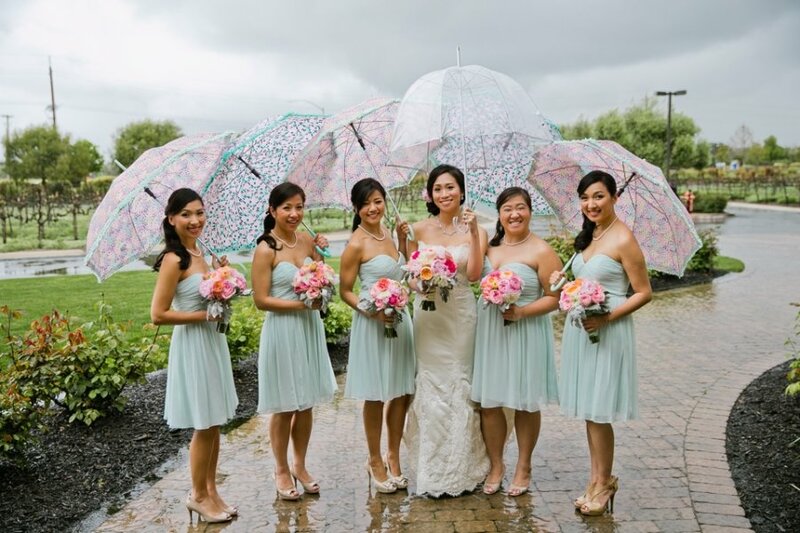 If your location has unpredictble weather, cute rain boots and a jacket or sweater in the wedding colours to keep you warm, dry, and stylish. If the weather is just too extreme for utilizing the great outdoors, an indoor reception can still have a romantic starry night vibe wih Faiy Lights, Naked Bulbs and a glowing fireplace. Embrace Fall and Winter's cozy, sentimenal environments by having your Wedding at a rustic log cabin with details like exposed rock an fireplaces. When it comes to small locations like this, keeping your guest list to a minimum is not only easy on the wallet, it adds to the intimacy of the experience. Antoinette Events is based in Bredasdorp in the Overberg from where they do wedding and events planning for a large part of the Western Cape. They do serve place like George, Mosselbay, Swellendam, Bonnievale, Robertson, Montagu, Greyton, Hermanus, Stanford and many more.